Statistical information gathered by DogsBite.org is verifiable through news reports and other criteria.1 Our Fatality Citations section documents sources used in our dog bite fatality research. In 2010, two fatalities involved dogs from two or more different breeds, thus producing a death count total of 37 rather than 34. Five dog breeds each contributed to one death: American bulldog, bullmastiff-mix, boxer, husky and a wolf-dog hybrid. In one case involving several dogs, the breed information was unknown or unreleased. In 2010, the combination of pit bulls (22) and rottweilers (4) accounted for 76% of the attacks resulting in human death. This same combination accounted for 73% (133) of the total recorded deaths (183) during the 6-year period of 2005 to 2010. The breakdown between these two breeds is substantial over this 6-year period. From 2005 to 2010, pit bulls killed 107 Americans, about one citizen every 20.5 days, versus rottweilers, which killed 26, about one citizen every 84 days. 2010 data shows that 59% (20) of the attacks involved children 11-years and younger and 41% (14) involved adults, 21-years and older. Of the child victims, 75% (15) were ages 4 and younger. Within this same age group, 60% were male. 35% (12) of all fatalities in 2010 involved more than one dog; 15% (5) involved a pack attack of four or more dogs; 32% (11) involved breeding on the dog owner's property either actively or in the recent past, and 9% (3) involved chained dogs. In 2010, dog ownership information shows that family dogs comprised 68% (23) of the attacks resulting in human death; 85% (29) of all fatalities occurred on the dog owner's property and 15% (5) occurred off the owner's property. 12% (4) of all deaths resulted in criminal charges; 50% (2) of these cases involved pit bulls. California filed criminal charges in 2 dog bite fatality deaths in 2010. Michigan and Tennessee each filed criminal charges after 1 death. The state of California had the most dog bite-related fatalities (7). 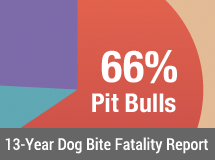 Pit bulls contributed to 86% (6) of these deaths. Florida followed with 3 deaths and Georgia, Illinois, South Carolina, Tennessee and Texas each incurred 2 deaths. Kyle Holland, 5-years old, was horrifically attacked and killed by a dog while living with his mother. The Wayne County Medical Examiner’s Office ruled the child’s death a homicide "due to multiple crush wounds due to multiple dog bites." Police seized both dogs in the home, which belonged to the mother's boyfriend, a husky type and a lab-mix. Lincoln Park Animal Control had previously relinquished the husky type dog to the boyfriend after a loose dog offense under a "good-faith" assumption that he would take the dog, suspected to be a wolf hybrid, out of state. Michigan prohibits the wolf-dog hybrids. The boyfriend did not comply. Deaths involving minor dog bite injury, dog-related caused injury (killed by a car while fleeing a dog) and cases that lacked a "reasonably clear" determination of death after dog bite injury are not included in our fatality statistical data. Deaths involving fatal non-bite injury (struck by dog death) or death due to untreated severe dog bites (sepsis) may be added to our data at a future time. DogsBite.org contains verifiable information about U.S. citizens killed by dogs including the name and age of each victim, location of attack, dog breed and up to 25 other factors. Our Fatality Citations section documents sources used in our dog bite fatality research. Learn more about our data collection method, which includes collecting breed identification photographs, police and coroner reports in certain cases, legal filings, court filings, legislative materials and more. Change Log: In February 2017, the 2010 Dog Bite Fatality Statistics were reissued with the following changes: The death of Larry Armstrong was reclassified as a 2010 dog bite fatality. Armstrong was killed by a pack of dogs on December 8, 2010. The 6-year combined total deaths of pit bull and rottweilers (from 2005 to 2010) increased by 1% due to reclassifications and additions in earlier years. In July 2015, minor adjustments were made to the overall 2010 statistics. One family dog attack was reclassified to non-family and breeding activity was added to another case. Decade of Adoption Focus Fails to Reduce Shelter Killing, by Merritt Clifton, Animal People, July/August 2009.